【Multiple Values & Premium Performance】With various drawers and cabinets design, you can surprisingly place your tissues, shampoos, creams, towels as you like. 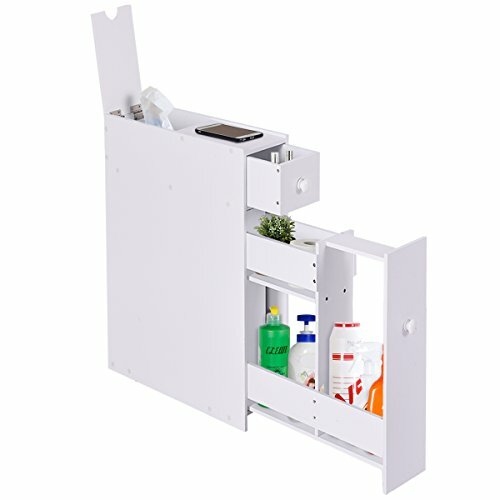 The lightweight slide-out bathroom floor cabinet helps you to make full use of space. Its premium performance can totally meet your demand of toilet storage. 【Optimal Organizer & Space Saver】 It maximizes your bathroom's available space while providing functional storage, which also makes you quick access to your bathroom accessories. The multiple cabinets design can perfectly improve the storage efficiency, which also brings a reliable using experience. 【Easy Assembly & Quick Storage】Easy to assemble with the included hardware can also wipe out the installing troubles. Quick disassembly enables you to store this portable shelf and can easily find its position when you move in or move out.